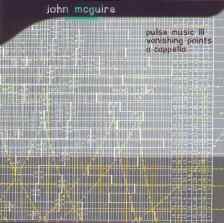 Click here for an essay by John McGuire, An Electronic Music Project: The Composition of Pulse Music III. John McGuire was born in Artesia, California in 1942. He began piano lessons at the age of 8 and french horn at the age of 12. He began began composing in college at 17. His principal composition teachers in California were Robert Gross at Occidental College, 1960 to 1964, Ingolf Dahl at the University of Southern California, Seymour Shifrin at the University of California, Berkeley, from 1964 to 1966, and Karl Kohn. In 1966-68 two consecutive Alfred E. Hertz traveling scholarships allowed him to begin an extended stay in Europe where he became directly acquainted with the music and thought of the European avant-garde. He studied counterpoint, instrumentation and composition with Krzysztof Penderecki at the Folkwang-Schule in Essen for two years, attended the International Summer Courses in Darmstadt in 1966 and participated in the Composition Studios of Karlheinz Stockhausen in Darmstadt in 1967 and 1968 on scholarship from the state of Northrhine-Westfalia. In 1970-71 he attended courses in electronic and computer composition at the Institute of Sonology in Utrecht. 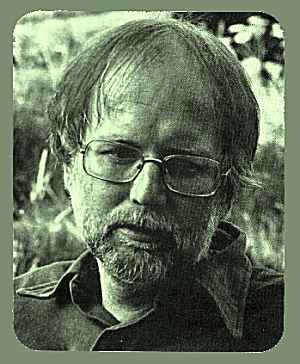 After his initial studies in composition in California and his work with Penderecki and Stockhausen in Germany his emphasis in composition gradually evolved into a search for a synthesis of the minimalism that had appeared in his native California in the 1960s and the generalized serialism with which he had become acquainted during his studies in Germany, principally through Stockhausen. His work over the next 25 years was devoted entirely to the exploration and development of various aspects of this synthesis, in particular the fusion of elemental tonal functions with chromatic time structures. Most of the works composed during this time were commissioned by the West German Radio. His music has been performed at the International Gaudeamus Music Week, 1971 (unanimously voted first prize), the ISCM festivals in Paris, Amsterdam and Aarhus, the Darmstadt Summer Courses, Festival Musica in Strasbourg, the ICA London, the Cologne Triennial, the West German Radio's Musik der Zeit (six times), the Zagreb Biennial, Festival d'Automne, Paris, the Logos Foundation, Gent, the Holland Festival, Klang-Aktionen, Munich, Pro Musica Nova, Bremen and the Bochum Planetarium; it was the focal point of the Winter Music in Karlsruhe in 1985 and of the Minimalisms Festival of the Berliner Gesellschaft für Neue Musik in 1998. Musicians such as Martin Bon, Ernest Bour, Pi-Hsien Chen, Daniel Chorzempa, Peter Eötvös, Gerard Fremy, Beth Griffith, Herbert Henck, Martine Joste, Manfred Kratzer, Hermann Kretzschmar, Marielle and Katia Labeque, Karl and Margaret Kohn, Ken-ichi Nakagawa, Yutaka Oya, Deborah Richards, Irmela Roelcke, Yukiko Sugawara, Bernhard Wambach and many others have been involved in performing his work. In 1998 McGuire moved from Cologne to New York City. John McGuire: Composer educated in California, Germany and The Netherlands. Extensive professional experience, performances and broadcasts throughout Europe. Relocated 1998 in New York after 32 years in Germany. 1963-64: String Trio Nr. 1, ca. 10', first performance Occidental College, May 1964. 1965: Study for Orchestra, ca. 6', first performance University of Utah, May 1965. 1965-66: Divergences for two string trios and piano, first performance May 1966, San Francisco Tape Center, John McGuire, piano, Charles Boone, conductor, ca. 8'. 1966: String Trio Nr. 2, unperformed, ca. 5'. 1966: Cadenza for String Quartet, unperformed, recorded at the West German Radio, Cologne, Hungarian String Quartet, 1967. 1967-70: Decay for Eight French Horns, first performance September 12, 1971, Internationale Gaudeamus Muziekweek, Utrecht, Mobielensemble Nederland, Jan Stulen, conductor,	published by Feedback Studio, Cologne, ca. 25'. 1970-74: Frieze for Four Pianos, first performance October 26, 1975, ISCM Festival Paris, Katia Labeque, Marielle Labeque, Gerard Fremy, Martine Joste, pianists, Jean-Pierre Drouet, conductor, published by Feedback Studio, Cologne, ca 22'. 1975/76: Pulse Music I, electronic music, realized in the Studio for Electronic Music, Musikhoch-schule, Cologne, first performance November 9, 1977, Feedback, 22'. 1975-77: Pulse Music II, for four pianos and chamber orchestra, first performance May 10, 1978, Festival Pro Musica Nova,Bremen, Christoph Delz, Herbert Henck, Deborah Richards, Doris Thomsen, pianists, Klaus Bernbacher, conductor, commissioned by Radio Bremen, Feedback, ca. 17'. 1978: Pulse Music III, electronic music, realized in the Studio for Electronic Music at the West German Radio, Cologne, first performance January 15, 1979, festival Musik der Zeit, Cologne, commissioned by the West German Radio, 24'. 1976-1980: Forty-Eight Variations for Two Pianos, first performance October 2, 1982, Deutsch-landfunk, Cologne, Herbert Henck, Deborah Richards, pianists, commissioned privately, Breitkop & Haertel, Wiesbaden, ca. 60'. 1981: Music for Horns, Pianos and Cymbals, first performance January 29, 1983, festival Musik der Zeit, Cologne, Daniel Chorzempa, Kristi Becker, pianists, members of the "Ensemble Cologne", Robert HP Platz, conductor, commissioned by the West German Radio, Breitkopf & Haertel, ca. 12'. 1982-85: Cadence Music for Twenty-One Instruments, September 14, 1985, Musik der Zeit, Cologne, Ensemble Modern, conductor Ernest Bour, commissioned by the West German Radio, Breitkopf & Haertel, ca. 27'. 1985-88: Vanishing Points, electronic music, realized in the Studio for Electronic Music, West German Radio, Cologne, first performance January 14, 1979, International Computer Music Conference, commissioned by the West German Radio, 26'. 1990-97: A Cappella for soprano and playback, realized in the Studio for Electronic Music, West German Radio, first performance Triennale Cologne, June 14, 1997, Beth Griffith, soprano, commissioned by the West German Radio, 23'. Editor, Carl Fischer Inc., New York, 1998. Visiting Assistant Professor, Columbia University, New York, 2000. "A Multiple Piano Project: The Composition of Frieze for Four Pianos", Feedback Papers, Vol. 11. Cologne, 1976: 1-31; reprinted in: Walter Zimmermann, Desert Plants / Conversations with 23 American Musicians, Vancouver, 1976: 331-346. "Interview with Walter Zimmermann", Walter Zimmermann, Desert Plants / Conversations with 23 American Musicians, Vancouver, 1976: 326-330. "An Electronic Music Project: The Composition of Pulse Music III", Neuland / Ansätze zur Musik der Gegenwart, Vol. 3, Bergisch Gladbach, 1983: 252-267. "Steve Reich: 'Drumming' - ein Werkkommentar", Neuland, Vol. 1, Bergisch Gladbach, 1981: 142-148 (originally written for radio, Deutschlandfunk, Cologne, broadcast September 19, 1979). "Steve Reich: 'Octet' - ein Werkkommentar", Neuland, Vol. 1, Bergisch Gladbach, 1981: 149-155 (originally written for radio, Deutschlandfunk, March 19, 1980). "Philip Glass: 'Satyagraha' - ein Werkkommentar", radio broadcast, Deutschlandfunk, December 5, 1982. "Walter Zimmermann: 'Lokale Musik' - ein Werkkommentar", Musiktexte, Vol. 12, Cologne, 1985: 33-35 (originally written for radio, Deutschlandfunk, December 5, 1982). "All in the Golden Afternoon - zur neuen Romantik David Del Tredicis", Musiktexte, Vol. 18, Cologne, 1987: 20-22 (originally written for radio, Deutschlandfunk, December 12, 1986). "Morton Feldman: 'Three Voices' - ein Werkkommentar", Musiktexte, Vol. 20, Cologne, 1987: 43-45 (originally written for radio, Deutschlandfunk, January 14, 1987). "Spiele um des Spiels Willen - der Komponist John Zorn", Musiktexte, Vol. 21, Cologne, 1987: 35-37 (originally written for radio, Deutschlandfunk, July 15, 1987. "Zu Charles Ives' Liedern" (Introduction), Ives & Co. / 13 Konzerte des Westdeutschen Rundfunks Köln, ed. Herbert Henck, West German Radio, Cologne, October, 1987: 7. "Kommentare zu Charles Ives' Liedern" (26 short commentaries), Ives & Co., ed. Henck, Cologne, 1987. "Henry Cowell, "Ostinato Pianissimo'", Ives & Co., ed. Henck, Cologne, 1987.